This is a must-have vegan-friendly natural plant protein! 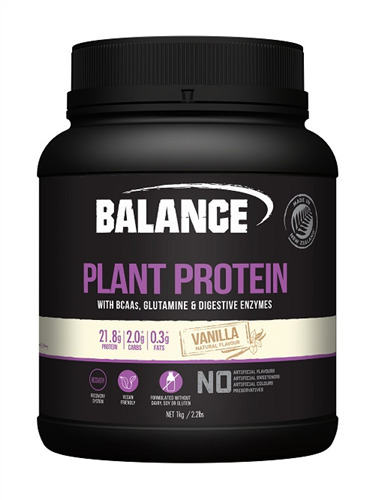 Balance Plant Protein certainly sets a high standard with 100% plant-based protein sources, including premium quality blend of pea protein isolate, chia protein, sacha inchi and organic rice protein. Sacha inchi is a relatively new protein powder made from the nut of the sacha inchi plant. The nut is carefully processed to remove the oil, which leaves a highly bioavailable protein, rich in naturally occurring amino acids. In fact, Sacha inchi has a full amino acid profile, containing all of the essential amino acids necessary for human health, as well as building, repairing and maintaining muscle. The finely-balanced selection of protein sources delivers a vegan-friendly protein powder that is easily digestible and the perfect alternative to whey proteins for lean muscle growth and recovery, or to support general health. Furthermore, this product contains a full complement of muscle-feeding amino acids, including added glutamine, and a scientifically proven 2:1:1 ratio L-Leucine, L-Isoleucine to L-Valine, which means that Balance Plant Protein will rival any other protein powder on the market. Understanding the benefits of different protein powders can be a challange. That's why Balance have covered all of the bases, so we don't have to worry. Balance Naturals Plant Protein powder is dairy free, soy free and is formulated without gluten. It contains no artificial additives, such as flavours, preservatives or sweeteners and is enriched with the digestive enzymes bromelains and papain to optimise protein digestion. These enzymes are derived form pineapple core and green paw paw, respectively, and help us to digest protein, which improves bio-availability. Balance Plant Protein ensures that you need not suffer any nutritonal disadvantage from switching to a plant-based product. Loaded with muscle protein synthesis-inducing essential amino acids, take it after exercise with a carbohydrate source to enhance recovery, between meals as a nutritious snack, or to fortify a low-protein meal1,2. Enjoy the CLEAN, LEAN MUSCLE GAINS and recovery that this awesome wholesome product has to offer. Plant protein is alkalising, whilst animal-based protein powders are acidifying. Plant protein powders are also a lot less likely to cause negative immune reactions, such as allergies and sensitivities. As lactose is only found in milk, all vegan plant protein powders do not contain lactose, and therefore cannot cause lactose intolerance. Plant proteins also tend to contain more fibre, and other nutrients too, like minerals, compared to animal-based products. Is Plant Protein Better than Whey Protein? Plant protein offers several advantages over whey protein powders, though whey protein still has the highest biological value of any protein yet tested. Many of the newer plant protein powders, especially those containing pea protein powder, have excellent amino acid profiles, and are comparable to whey protein in terms of quality. However, whether one product is better than the other all depends upon your individual needs. For example, if you are vegan and have dairy allergies, then obviously plant protein is better for you. Add 30g (1 level scoop) of Balance Naturals Plant Protein powder to 350ml of cold water or liquid of your choice, shake and cosume immediately. For best results use 60 - 90 prior to exercise and within 30 minutes post-training. Balance Plant Protein can also be added to other foods to increase protein content. Consume up to 3 serves per day. INGREDIENTS: Balance Plant Protein Blend (93%) [Pea Protein Isolate, Organic Brown Rice Protein Concentrate, Chia Protein Powder, Sacha Inchi Powder], Amino Acids [L-Glutamine (92%), BCAAs, (1%) (L-Leucine, L-Isoleucine, L-Valine)], Natural Flavours, Enzymes (0.4%) (Bromelain, Papain), Natural Sweeteners (Steviol Glycosides, Thaumatin).